Everyone loves the classic holiday message- "I love you so much I killed this tree for you." Wait, what? This isn't the goal? Let's look closer. At this moment in the year, we start shopping for our Christmas card. Many of us send each other holiday cards to wish friends peace and joy, to celebrate the holidays, and to show off their family in totally not posed pictures of family togetherness. I can joke, but I am as guilty as anyone of sending these cards and being so happy to receive them. It is equally nice to be wished happiness and to see how happy people I care about are. 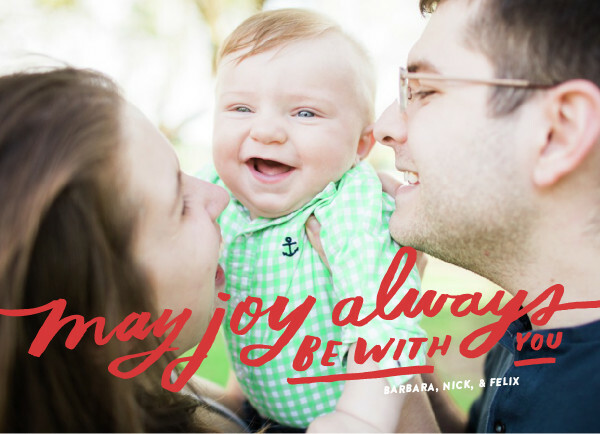 Christmas cards may be cheesy, but they are also awesome. 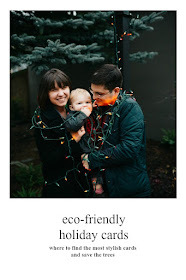 Even better, if you are trying to have a more eco-friendly holiday season, then the cards create a pretty obvious opportunity to make some positive changes! This is an opportunity to save trees, that keep our Earth cooler, our air cleaner, and our view prettier. Think about how many trees must go down for all that holiday cheer in the mail- and we can fix it easily by moving on from the regular spots for cards. If you can celebrate the holidays by being a steward and preserving God's creation (if that is your deal), why wouldn't you do it? If the holiday season really isn't about consumerism, we need to approach it with the spirit of stewardship first. The good news? Recycled card options are EVERYWHERE, they just may not be where you would look first. Skip Shutterfly and Tiny Prints. Tiny prints weirdly comes up when you search for eco-friendly Christmas cards, but they aren't, so that is an infuriating scam. They don't use any recycled paper as far as I can see. That being said, so many other places do. To be clear, this blog does use affiliate links for Amazon and Etsy, but I am not getting any money from the companies I am schlepping here. I just genuinely think they are awesome and want to stop getting tiny prints cards. Green Field Paper Co is now my first stop for paper good browsing. Not only do they have great designs, they also feature more types of eco-friendly statonary than anyone. When you see just how many creative and eenviromentaly responsible options are out there, it's hard not to question why all paper companies don't try this route. My favorite- cards specifically made out of recycled junk mail! That is genius. All the other cards need to step it up. They also have plantable cards, ornaments, and gift cards (these are made of recycled paper and have seeds in them- bonus, they are all made in San Diego). Seriously, look here before you buy a box of cards anywhere else. Paper Culture is another gem- a perfect first stop if you want a cheesy/wonderful photo card (don't be ashamed; I love them too). Paper Culture recognizes their carbon footprint, and they try to offset it by using 100% post-consumer paper for their cards and by planting a tree for every order they sell (they are at about 550,000). The Arbor Day Foundation does it for every card (so significantly more depending on your order), but these cards gave a little more design to them and have photocard options, so they may better fit. Their designs vary from bright and busy to minimalist and chic, so you are sure to find something you like. Plus, they don't cost any more than those photo cards from Tiny Prints. How did we not all know about this before?! I have a lot of loyalty for Minted cards; we got our save the dates and birth announcements from them, and their cards always look great and modern. They are pretty comparably priced to Tiny Prints, just a little more expensive, but they offer 100% recycled paper for 15 dollars more. To me, that's worth it, and I will just buy fewer cards to cover the cost. Artifact Uprising makes more sophisticated and minimalist cards, made out of recycled paper. Lots of great choices that keep the focus on the images without so much riff raff. Artifact Uprising is a gem for lots of things you use Shutterfly for now, so check them out. The Arbor Day Foundation sells 100% recycled "Give a Tree" paper cards as a fundraiser. Every card you buy puts money towards planting trees, so not only are you preventing more trees from coming down, you are also helping plant more! I love this idea so much, though I can't really say that the designs are anything to get excited about (some designer- volunteer your time). Think, if you did this every year at Christmas, how many trees you could help plant in a lifetime. What a sweet addition to your holiday traditions. We all knew I was going to say it- you still have time to buy your cards from etsy, so you can start with this search to find eco-friendly options on there as well. Skip the Foil- Foil pressed cards are really pretty, and they are super popular right now. Skip them. You can't recycle them and they won't biodegrade. You can spend your money better. Buy Less- Pick a smaller than regular number to send and just don't send them to those people on the list that feel like a stretch. It can make a big difference to just cut down your numbers to the people you really care about. Above all, Save the Trees- With so many recycled paper options out there, it really doesn't make sense to send a card on virgin tree paper. Ever! It's so easy! That's it! Christmas is kicked off and I will have a ton of ideas for how to make tiny changes to your Christmas plans that will have a big impact on the Earth. Have specific questions? Let me know and we will try to address them. In the meantime, check out the Christmas lists from last year on The Giant List of Shopping Lists. I like this post! I already purchased my eco friendly cards for Christmas. I'm in Australia so used a company called Earth Greetings. Same price as normal cards with free delivery. I was happy. This is so great! I’ve been trying to make our life more eco friendly so I’ll definitely be checking these out before I order. Thanks for the info! Such a great list! Will absolutely be checking these out! I haven't done much for holiday cards the past couple years, but this year we are traveling over Thanksgiving break and I hope to get a nice family shot that I can use as a Christmas card photo. I will have to keep this list in mind - thanks for putting this together! I've never done a holiday card because I feel like it is wasteful. This is a great alternative! I'll look into these and maybe this year I'll actually make a holiday card. Thank you! Great idea. We don't usually do a card but with a new baby we are going to do a combo holiday/baby announcement card this yea.